XperiFirm Tool makes the tedious task of manually searching and downloading stock Sony Xperia firmware easy. Xperifirm downloads Sony firmware from official servers and there is no chance of firmware being corrupted. 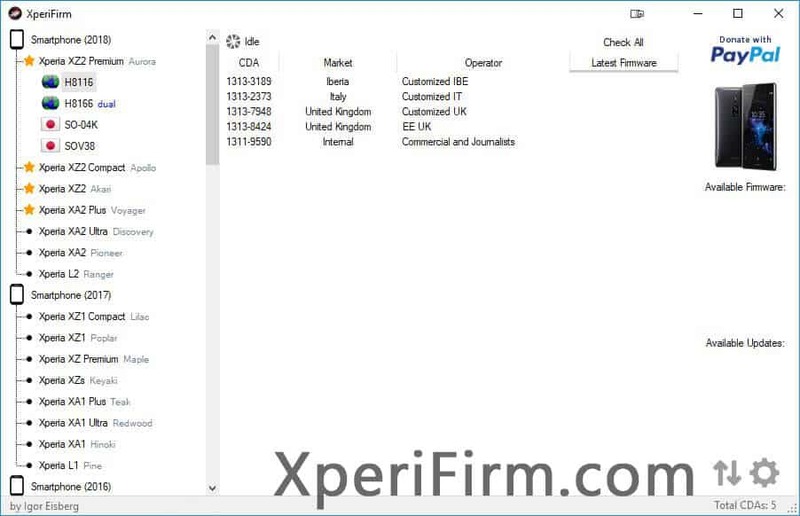 Here on this page, you can download Xperifirm v4.9.1 for Windows 10/7/8/8.1, Linux and Mac. NEW: Added support for Accessories (currently, just SmartWatch 3). FIX: Solved the lag cause by the image loading of each device. FIX: Some additional internal changes had to be made as part of the incremental transition of Sony's firmware database from the old servers to the new one. Many of the "grayed out" firmware will no longer appear on XperiFirm, as they are no longer available on Sony servers. MINOR: Added a "Available Releases" label for those who don't get the hint that they have to select a release version. Below you can download Xperifirm v4.9.1 for Windows, Linux and Mac. To use it on Linux and Mac, install Mono on your system (instructions provided below). [*] Always Scan First: We have scanned XperiFirm_4.9.1_(by_Igor_Eisberg).zip before sharing it here. However, we still recommend you to scan the file before using.